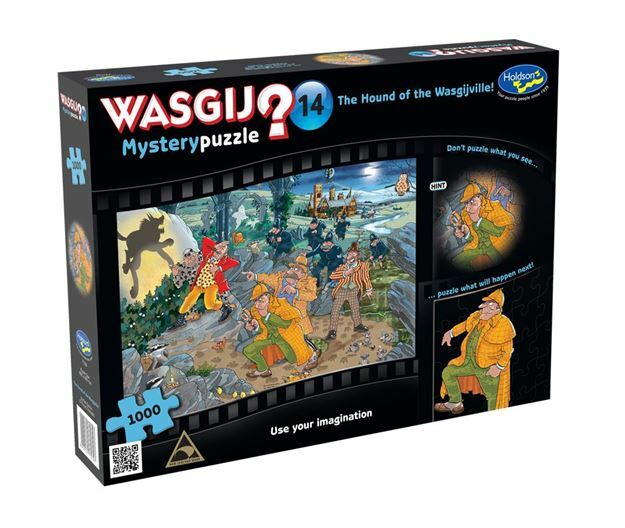 Detective Sheer-Luck is investigating a difficult murder case and the lead suspect is a ferocious hound… try to piece together what will happen in this Holdson Wasgij Mystery 14 1000pc puzzle. With help from an escaped convict they are led to the suspect but nothing is as it seems... Is someone playing tricks on Detective Sheer-Luck? Where does the trail of paw prints lead, and has the moonlit sky helped to highlight the shadows on this dark night? Use your imagination to piece together what will happen next. The puzzle holds the answer! The picture on the box lid is not the puzzle; it is simply a clue to what the puzzle is! Age 8+ years. Made in New Zealand by Holdson. Approximate puzzle dimensions: 688mm x 493mm. Box size: 270mm x 370mm.